The Villas at Canterbury Woods is an intimate 136 home community with walking trails, a clubhouse, outdoor swimming pool, and more. Located in Westerville, Ohio, homeowners are close to Columbus, Ohio for big-city excitement, but far enough away to leave the hustle and bustle behind. With a homeowners’ association (HOA) to take care of maintenance and chores, residents enjoy lives of ease and relaxation, with more time to spend attending holiday parties and pursuing new hobbies. The fun and excitement at The Villas at Canterbury Woods begins in the clubhouse. There, residents have access to an exercise room for staying fit, or they can relax and mingle with neighbors and friends in the multi-purpose room. Outside there is a pool and patio for taking a dip or lounging poolside with a book. Walking and biking trails will take you around the beautiful parks and natural spaces the community has to offer and can lead you to the gazebos that rest on the shores of the community’s scenic ponds. Epcon Communities built 136 attached residences in The Villas at Canterbury Woods. They include four distinct floor plans. Each plan includes two or three bedrooms, two or three bathrooms, and attached two-car garages. The plans include features like vaulted ceilings, sunrooms, garden-style patios, and some come with a den. Homeowners can spend their days unwinding at home or having fun at the clubhouse since they won't need to stress over cutting the grass. The HOA takes care of the hassle of home maintenance for residents at The Villas at Canterbury Woods. The HOA fee includes lawn mowing, lawn irrigation, fertilization, weed control, landscape maintenance, exterior home maintenance, driveway and street maintenance, common lighting area, and garbage removal. Residents of The Villas at Canterbury Woods can also have fun with other neighbors by hanging out at the clubhouse and participating in events and activities. Some of the social activities include holiday parties and potlucks, ladies salad luncheons, and coffee klatches. Located in Westerville, Ohio, The Villas at Canterbury Woods is near many of the things you’ll need every day. Just down Maxtown Road less than five minutes away, you will find Northgate Plaza, a mall that includes a Kroger and The Home Depot. Just as close, you’ll find a Giant Eagle Supermarket and a Meijer for all your daily needs. Just 25 minutes south is the city of Columbus, Ohio. There, you’ll be able to experience big-city attractions like the large Franklin Park Conservatory or tour the historic German Village, with cobblestone roads and many authentic German restaurants and shops. The Columbus Zoo and Aquarium is a fun attraction to visit when your family comes to stay. Blacklick Woods Metro Park is a 643-acre park with wooded trails and picnic areas that’s made for enjoying a wonderful afternoon surrounded by nature. When traveling farther away is needed, the John Glenn Columbus International Airport can be reached in under half an hour. 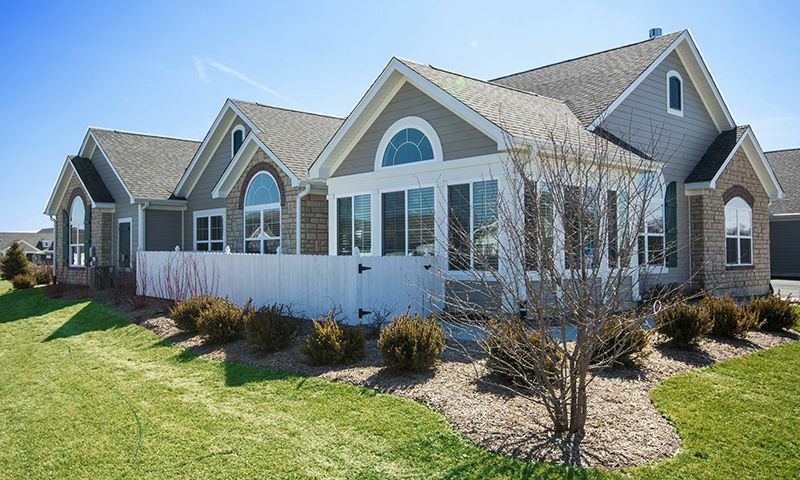 The Villas at Canterbury Woods offers a quiet and peaceful setting for residents to relax and enjoy their community, all while being located close to big-city arts and entertainment opportunities just outside of Columbus, Ohio. There are plenty of activities available in The Villas at Canterbury Woods. Here is a sample of some of the clubs, activities and classes offered here. 55places.com is not affiliated with the developer(s) or homeowners association of The Villas at Canterbury Woods. The information you submit is distributed to a 55places.com Partner Agent, who is a licensed real estate agent. The information regarding The Villas at Canterbury Woods has not been verified or approved by the developer or homeowners association. Please verify all information prior to purchasing. 55places.com is not responsible for any errors regarding the information displayed on this website.